First day's during the residency, i was getting to know Eleonore, the crew and other boats from Donautics cummunity. During residency on Eleonore, I worked in my DIY wet lab and sound studio. The DIY wet lab is done ala hackteria style / http://hackteria.org/ . I did carried out xperiments with Hydra's (freshwater polip) / http://en.wikipedia.org/wiki/Hydra_%28genus%29 /. We had also some mini workshop's, experimental afternoons . We did build together with Taro and Martina a DIY microscope. The lifepatch DIY microscope stage kit / http://lifepatch.org/ is prepared - ready for use also for later on since it will stay as a wet lab station on Eleonore. The outcome of the residency: creating an ambiental poetic immersive performance. The performance features sound recordings generated by Hydra, mixed with the sound recording - the archive of the time reminiscence, collected during the 14 days’ of the sounds scape of the Donau below the water line. Building the DIY microscope at Eleonore with Taro and Martina. It's biologically immortal freshwater animal /http://www.daviddarling.info/encyclopedia/H/Hydra.html // http://en.wikipedia.org/wiki/Biological_immortality /. 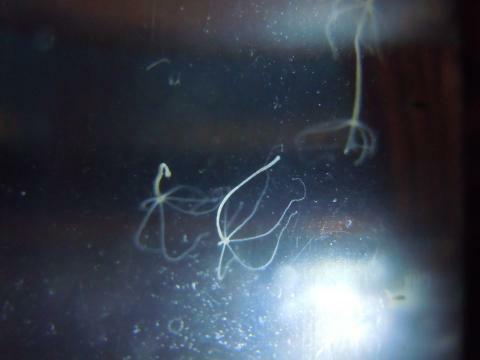 The first experiments that explored the regenerative properties of Hydra took place 250 years ago. Nowadays, it is scientifically proven that the Hydra can be completely regenerated to 1/200 part of her body. This impressive fact inspires further material exploration on the regeneration of Hydra’s pluripotent stem cells. The first experiments and discoveries about the excellent regenerative properties of Hydra began in 1744 when biologist Trembley did publich the book: "Memoirs Concerning the Natural History of a Type of Freshwater Polyp with Arms Shaped Like Horns (Memoires, pour servir a l'histoire d'un genre de polypes d'eau douce, a bras en forme de cornes, 1744). Eleonora's home - spot is near to the city, nature and industry. The strange, contrasting sound scape inspires me. I do record sounds / noise and build different DIY hydrophones to record the sounds scape of the Donau below the water line. During the residency, we had also really nice meet up: Eleonore's experimental afternoon / a mini-workshop / DIY Hydrophone / Hydra hacking, with Michael-Lupo, Marie, Taro, Martina, Holger, Ana, Alessio on the main deck.